We display ours in our executioner's guillotine prop!!! 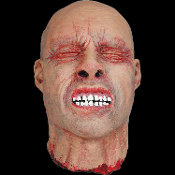 Painful squeamish look on his grimaced face says it all about this involuntarily dismembered cut-off severed undead zombie head! This unfortunate victim shows a frighteningly painful grimaced expression, preparing for the whatever executioner's death blade is coming his way! Approx. Dimensions: 10.5-inch (26.25cm) High x 7-inch (17.5cm) Wide x 7-inch (17.5cm) Deep.